Over the last year I have noticed you in Tesco, greeting customers warmly, always with a smile and always working hard. You always show politeness, you always offer your help and you always give the best possible service you can. When I sat in the car outside of the Tesco Extra in Kettering, my heart was pounding. I had planned this moment for months. I was full of anticipation. I wanted to give you this moment so much. I walked in and looked for you and of course you were busy helping customers. I stood amongst the clothes section (looking fairly dodgy!) and waited for my opportunity. Why did I do that? – because you deserve recognition for the happy, polite and warm service you consistently have offered to us and others. You said you were just doing your job, but there is a huge difference with doing your job and DOING YOUR JOB. Tesco should be proud to have you as a member of their staff. I will forever treasure that moment we shared and the words we exchanged. Previous Dog Friendly Cupcakes | Puppy’s 1st Birthday! Next Jamaican Jerk Pulled Pork Sliders – Recipe & Cheeky Little Giveaway! Omg, my heart! This was soooooo sweet. It’s rare that you come across someone that’s dedicated to their work like that, but when you do… it’s refreshing. Thank you Esse! It was such a wonderful moment to have. I urge anyone to do the same. She is amazing! How nice of you to show recognition! I’m sure she appreciated it! Customer service can be challenging and it takes a special person to keep that smile on day in and day out! Lynz, this is such a simple but big-hearted act! 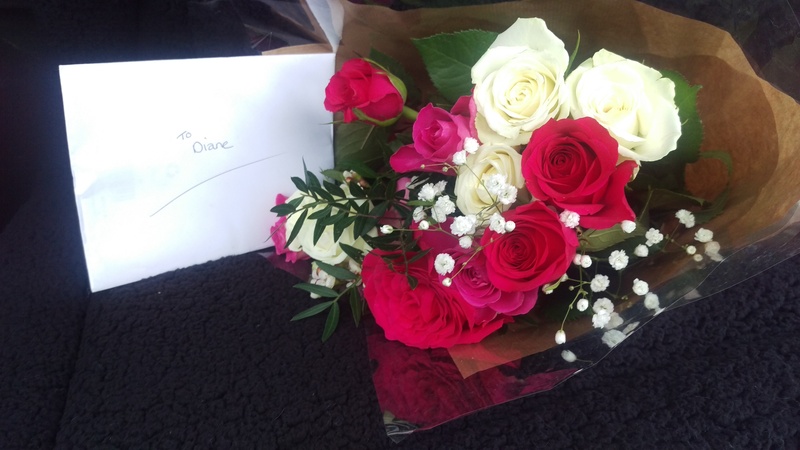 I would of love to have seen Diane’s face when you gave her the flowers. Your random act of kindness is very contagious, and I would love to spread the love as well. Great post! This is so sweet of you. I love this post! If weird is being kind, then yes I am. Oh wow! What a great surprise! That’s so incredibly nice.